This relief print began as a very small illustration contained within the pages of an antique dictionary. 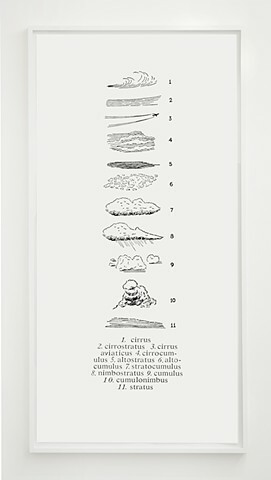 The 3rd cloud, Cirrus Aviaticus, was inserted by the artist as an update, taking into account the ‘new’ epoch of the Anthropocene. In contemporary meteorology Jet Trails (Cirrus Aviaticus) are regarded as a significant cloud form.